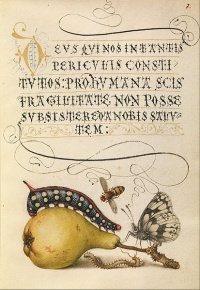 Mira Calligraphiae Monumenta is a sixteenth-century calligraphic manuscript written by Georg Bocskay and illuminated by Joris Hoefnagel. "In 1561-62, Georg Bocskay, imperial secretary to the Holy Roman Emperor Ferdinand I, inscribed the Mira calligraphiae monumenta as a testament to his preeminence among scribes. He assembled a vast selection of contemporary and historical scripts, which nearly thirty years later were further embellished by Joris Hoefnagel, Europe's last great manuscript illuminator. This book, now in the collection of the J. Paul Getty Museum, is reproduced here in complete facsimile form, accompanied by a commentary that includes a full description; a discussion of its patron, Rudolf II, and his cultural and historical milieu; the biographies of Hoefnagel and Bocskay; and an analysis of the manuscript's role in their careers. The introduction discusses the broader issues raised by the manuscript. Topics include Hoefnagel's nature imagery, which encompasses plants, fruits, and small animals, and its relation to the spread of interest in botany and zoology at the end of the sixteenth century. Another topic is calligraphy and its place in the art and culture of the sixteenth century. The manuscript's remarkable calligraphy will be of particular interest not only to scholars but to collectors, graphic designers, and typographers as well." Grotesque mask (Hoefnagel), see Mask with dishes around the eyes and pointed serrated crests on the cheeks and forehead. Unless indicated otherwise, the text in this article is either based on Wikipedia article "Mira Calligraphiae Monumenta" or another language Wikipedia page thereof used under the terms of the GNU Free Documentation License; or on original research by Jahsonic and friends. See Art and Popular Culture's copyright notice. This page was last modified 16:41, 20 January 2014.